GLASGOW, Scotland (AP) — Russian teenage swimmer Kliment Kolesnikov added a gold and a silver to his European Championships medal haul in just over an hour’s span on Monday. Kolesnikov dominated the men’s 100-meter backstroke for his third gold, and returned to the pool shortly afterward to help Russia take silver in the 4×100-meter medley relay. It raised his total to four from as many events. On Saturday, Kolesnikov improved the world record in the 50 backstroke to 24 seconds, a day after triumphing with the Russian team in the 4×100 freestyle relay. A fifth medal is likely to follow after the 200-meter backstroke on Wednesday. Kolesnikov, who turned 18 last month, is living up to his billing as one of the big prospects for Russian swimming at the Tokyo Olympics in 2020. A year after his international debut at the 2016 European junior championships, he enjoyed his breakthrough, placing fourth in the 200 backstroke at the world championships in Budapest and winning four titles at the European short-track championships in Copenhagen. In Denmark, he just missed out on a perfect five golds from five events as he was edged for the 50 backstroke title by Italy’s Simone Sabbioni. 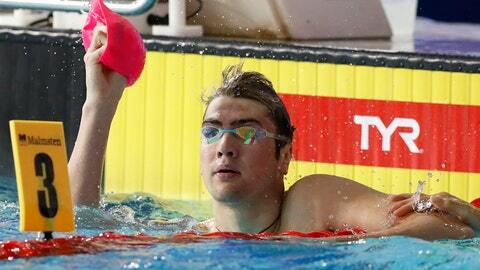 Sabbioni was no threat to Kolesnikov in the 100 backstroke on Monday, finishing 1.32 behind in sixth. Kolesnikov opened fast and gradually extended his lead. He seemed to be cruising to victory until fellow Russian Evgeny Rylov started to catch up in the final 20 meters. Kolesnikov held off the challenge to clock 52.53 seconds, with Rylov, the 200 backstroke world champion, coming 0.21 behind. Greece’s Apostolos Christou came more than a second behind in 53.72 for bronze. Less than 80 minutes later, Kolesnikov opened the relay event for Russia and beat his time from earlier tonight by 0.02 for a new personal best. The 52.51 time meant yet another junior world record, but also left him still well short of the world record of 51.85, set by Olympic champion Ryan Murphy of the United States at the Rio de Janeiro Games. But records are not what Kolesnikov is bothering about at these championships. The medley relay was won by Britain in a European record time of 3 minutes, 40.18 seconds. It gave Adam Peaty his second gold medal after setting a world record of 57.10 in the 100-meter breaststroke on Saturday, just an hour before Kolesnikov swam his. In track cycling, Dutch world champion Kerstin Wild won her second gold medal as she saw off Katie Archibald in the women’s omnium. They also finished 1-2 at the 2017 European Championship where the British rider claimed gold. Archibald narrowed the gap with leader Wild to two points after winning the third of four events, but Wild was the strongest in the concluding 20-kilometer points race and ultimately took the title by 12 points. Belgium won the men’s madison at the Sir Chris Hoy Velodrome as Robbe Ghys and Kenny De Ketele gathered 60 points to beat world champions Roger Kluge and Theo Reinhardt of Germany, who finished on 49. Britain’s Ethan Hayter and Oliver Wood took bronze with 38 points. Also, the diving competition opened at the Royal Commonwealth Pool in Edinburgh with Ukraine winning the mixed team event. Oleg Kolodiy and Sofiia Lyskun were third before the final round but both successfully executed dives with the highest degree of difficulty to overtake early leaders Germany and Russia. “It’s unpredictable in our sport. You need to fight until the last dive,” Kolodiy said.